Suzan Marczak is an artist living and working in Vancouver, British Columbia, Canada. Her acrylic paintings explore the wild country of the west, from the pristine mountains and forests to the modified landscapes of the metropolis. Marczak attended the studio arts program at Capilano College and graduated Emily Carr University with a Bachelor of Fine Arts in 2002. Her work is held in corporate and private collections across North America. Please visit the gallery page to view a selection of her paintings. An active member of the arts community, Marczak holds various non-profit board positions and participates in the Eastside Culture Crawl. 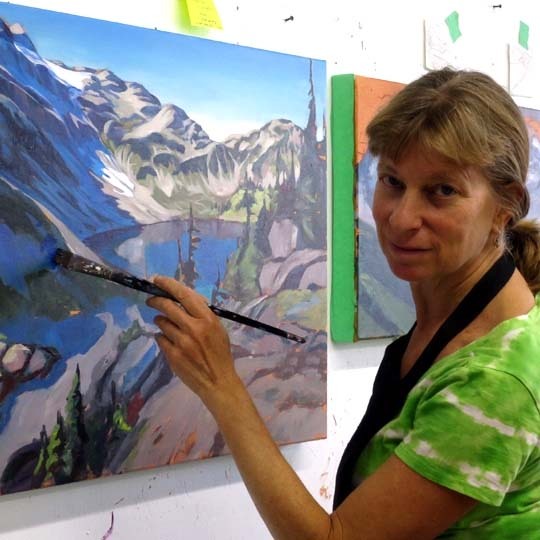 Her work is available from the North Vancouver Art Rental program. 2017 Sandcastles. With Nori Braig. The Garage Gallery. May 3-23. Vancouver, BC. 2015 Mt St Hilaire Land Art with Ken Clarke Oct 15-20. Installation. Mt St Hilaire, Quebec. 2009 The Village Brittania Gallery, Vancouver, BC. Oct 7-30. 2007 Blink Seymour Gallery at the Quay, North Vancouver, BC. Feb 15-28. 2006 Rhythm of the City with Brent Halfyard. Maple Ridge Art Gallery Sept 7-30. 2006 Suspect Jericho Arts Centre, Vancouver, BC. May 1-20. 2005 Synchronized Soul . N Van District Hall. N Van, BC.Feb- 17-March 17. 2004 Preview Show with Wendy B. Firehall Arts Centre, Vancouver, BC. Nov 4 - Dec 1. 2004 Our Town The Cook and the Baker, Vancouver, BC. Feb 2- Mar 23. 2004 Manufactured: made by hand Ron Andrews Rec. Centre, N Van, BC Jan - 4-Feb 8. 2003 Indusrial Icons Amelia Douglas Gallery, New Westminster, BC. Sept 18- Oct 30. 2002 Highrise Dreams Portfolio Gallery, Vancouver, BC. August 3-Sept 4. 2001 Urban Heroes Lounge Gallery, ECIAD. Vancouver, BC. March 30 - April 7. 2016 Art Around Us. The Art Institute, Vancouver. Jan 21-March. 2015 Art in the Garden. North Vancouver private garden. May 23-24. 2009 Group show. Ian Tan Gallery, Vancouver, BC. June 5-26. 2008 Cityscapes Swirl Gallery, Calgary. June 1-30. 2008 Vancouver, Perspectives in Paint. Yaletown Gallery, Vancouver. April 3-16. 2006 FOOTPRINTS Roundhouse Community Centre, Vancouver, BC. June 21-July 19. 2006 HERE BE MONSTERS Performance Works, Vancouver, BC. March 9 – 16. 2006 MANY HAPPY RETURNS Ayden Gallery, Vancouver, BC. Feb 24-April 2. 2005 OUT OF THE RAIN Roundhouse Community Centre, Vancouver, BC. Nov 2-17. 2005 EVOLUTION Concourse Gallery, ECIAD, Vancouver, BC. Aug 5-Aug 28. 2005 BC IN A BOX Blackberry Gallery, Port Moody, BC. May 5-28. 2004 ARTS 2004 Juried Show Surrey Art Gallery, Surrey, BC. June 19-Aug 1. 2004 RE: Access Artist Run Centre, Vancouver, BC. Jan 24-Feb 14. 2003 URBAN VISIONS Waterfall Gallery. Vancouver, BC, Nov 20-Dec 20. 2003 THE URBAN FIGURE Versatile Gallery. North Vancouver, BC. Nov 1-30. 2003 ALTERED LANDSCAPES Cityscape Community Artspace, N Van, BC. Jan 23-Feb 16. 2002 RUST Glass Onion Gallery, Vancouver, BC. June 23 – July 21. 2002 SENSE AND SENSITIVITY Portfolio Gallery, Vancouver, BC. February 7-March 6. Burnaby Potters Guild since 2002. Various executive positions.